﻿ Top Pub Crawl Music to Get in the Mood! Music selection is essential to a proper party, and pubcrawling is the same business. The Pub Crawl Barcelona night-outs visit the most hip and popular clubs of the city where great music is played every night – but what about before your crawl? Getting hyped for a party during the magical hours of preparation is just as essential as the party itself! And this is where music plays an important role! Here’s Pub Crawl Barcelona and the List of Awesome Music for Pub Crawl Preparation – Yes We Like Short Titles! Featured in Woody Allen’s roller-coaster of a ride movie Vicky Christina Barcelona, Giulia Y Tellarini’s Barcelona might seem like a cheesy first pick, but the guitar is irresistible. 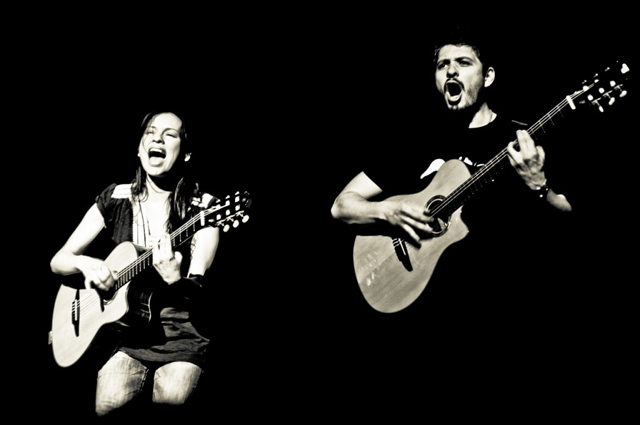 Next up another melodic guitar piece, the ever charming duo of Rodrigo y Gabriela will surely put you in a Mediterranean mood with Tamacun. Also check out their song titled Vikingman! Enough of the guitars, it’s time to step up the tempo! Gente De Zona and Marc Anthony’s La Gozadera is yet another spirited summer tune. Irresistible, instant dance floor hit! Juan Magán, Paulino Rubio, DCS: the authors of a melodic club hit titled Vuelve. The lyrics might not be the most complicated ever, but the tune is catchy and easy to love! This one’s an oldie but goldie. From the album Pure Latin Dance, Elvis Crespo’s Suavemente does not disappoint on the title. Energetic, lush, instantly will get you into the pub crawl mood! What are you waiting for? Book your pub crawl magic right away – we are already dancing! Suave!